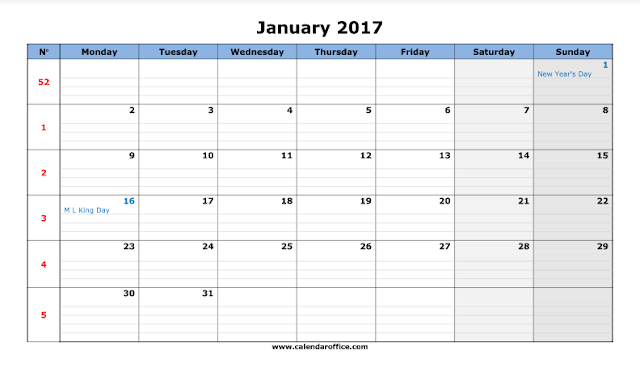 Looking for January 2017 Calendar? Through this page you can download four calendar templates of the month January in different format & design. Use these calendars for your personal as well as professional work. From below you can download January 2017 calendar with week number, notes calendar, holiday calendar, and weekly calendar. Each calendar has its own importance & serves you with multiple benefits. If you need a calendar to write down important activities then it is recommended to download a notes calendar which has enough space in the left sidebar for you to write or leave notes about work or anything else. If you simply want to track down weekly activities then go for a weekly calendar. Use of printable calendar is a best way to get organized & focused towards your goal. Download Holiday & Weekly calendar. There are two holidays in the month of January i.e. New Year Day on 1st January & Martin Luther King Day on 16th January. To have a proper schedule of your work, download weekly calendar to track or record your weekly activities in a much easier way. As a working professional or a student to plan you days out or to just decide what you're going to do next, having a calendar provides helping hand to manage all the work in an organized manner. Use monthly calendars for your monthly activities or else weekly calendars to manage weekly activities & daily calendar to schedule daily activities. A calendar has all the dates, days, holidays, and other important events at one place by keeping them in mind you can plan your activities in an efficient manner. 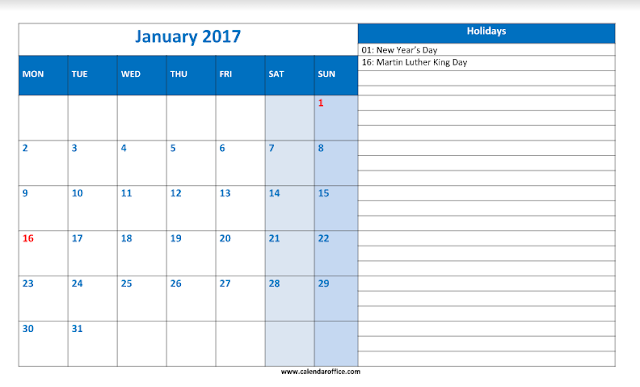 Rather than creating a calendar in Microsoft Word or Excel which could be time consuming, it is recommended to use our ready to use January 2016 Calendar Templates which are easily downloadable & printable. There are four calendar templates shared in this page. Scroll above to download a January calendar and if you are looking for upcoming months calendars then click on the links shared below. A calendar is a useful resource which is used to maintain a disciplined lifestyle. It is more convenient & easy to use a calendar rather then costly tools available for time management. To use a calendar, all you need to do is download a calendar in any format i.e. word, excel, and pdf then take their print-out and start managing your activities. Specially students and working employees must make a habit of using calendars to maintain a well disciplined life. This is all from our side. 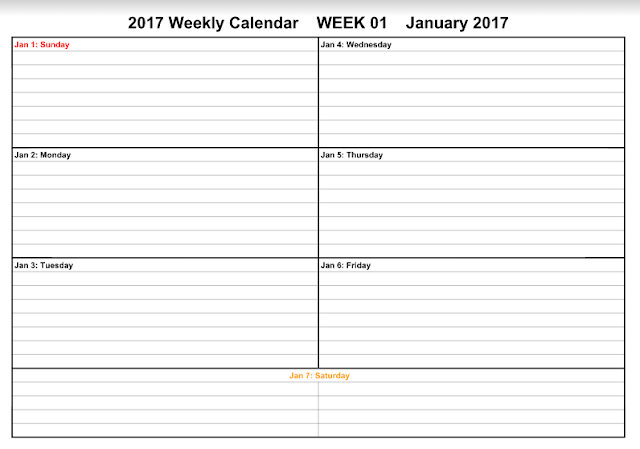 We've designed these January 2017 Printable Calendar templates for our users. 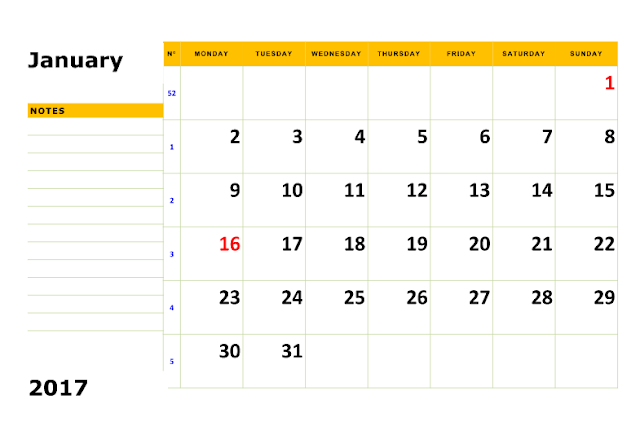 Through this page we've provided blank calendar, holiday calendar, notes calendar, and weekly calendar. If you want calendar in any other category then describe us through the comment section. Also, check out out other articles as well for more calendars in various categories & formats.